This is my favorite salsa. It's colorful and fresh tasting. 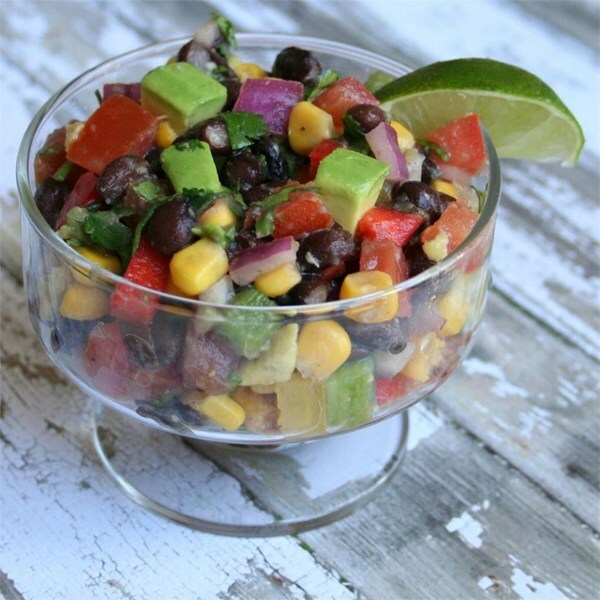 Combine black beans, corn, chopped tomatoes and next 7 ingredients in a bowl. Add avocado last and lightly toss so not to mush up. Cover using plastic wrap putting it right on top of salsa (this helps keep the avocados from turning brown) and chill at least 2 hours. Serve with tortilla chips. Tip: I like to take the lime (after it's been juiced) and rub down the bowl you will be serving the salsa in. I also rub the lime on the plastic wrap this will help keep the avocados from turning brown. !! !This makes a lot! What I do if we won't be eating the whole batch is I will make the salsa and only add the avocado, tomato, lime juice and vinegar to half the batch. That way the the rest of the batch with the beans, corn, onions and peppers will stay fresh in the fridge until you want to make more. The other day I had a 1/2 batch of salsa in the fridge and I made some new potato salad with mayo and a little Dijon. Then I folded in the corn salsa and diced avocado. It was so good! It's always fun to reinvent leftovers.